UK Release Date - 28th March 1988. UK Release Date - 5th April 1988 (Limited Edition 12" Box). US Release Date - 2nd November 1988. Engineer - Nigel Green (Track 02 backing track). Engineer - Ronald Prent (Track 02 overdubs). Special Formats - Limited Edition Picture Disc CD Single. Special Formats - Limited Edition 7 Inch Poster Bag Sleeve with fold-out poster. Special Formats - Numbered Limited Edition (5,000 copies) 12 Inch Boxed Set. It features five postcards/poster/enamel 'Armageddon It' logo badge. Special Formats - Canadian Limited Edition 7 Inch Picture Disc. The forth UK single from 'Hysteria' was released in March 1988. 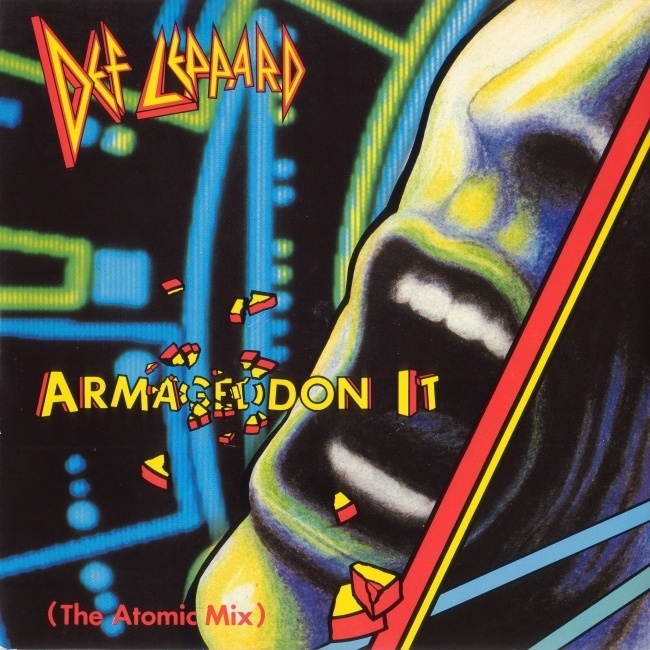 'Armageddon It' was another UK hit peaking at number 20 on the UK Top 40. It then reached number 3 in the US in early 1989 after being released there in late 1988. It spent five weeks in the Top 10, staying at number 3 for 2 weeks whilst the album was still Top 5. New track 'Ring Of Fire' was included on the UK version along with 'The Nuclear Mix' extended version. 'The Atomic Mix' is the same as the album version, the title used to promote the extended mix on the 12". This was only done on the UK editions. The UK CD was the first Picture Disc CD release here and came in a slim jewel case. 'Animal' and 'Pour Some Sugar On Me' were included on the CD as the 'Animal' CD single was so limited and 'PSSOM' was not issued as a CD single in the UK. 5.000 Limited Edition 12" card boxes were issued in the UK. It contained a poster featuring the Lep logo and exploded single logo on a black background and 'Armageddon It Is Here' in yellow beneath that and a list of the formats. The other side is plain white. 5 postcards that are one sided with black and white Ross Halfin promo shots of each member. Plus an enamel badge has the Armageddon It exploded logo embossed on it housed in a plastic bag. The regular 12" is also inside the box. Various promo formats feature an Edit version that lasts for 4:40 and fades just before the last chorus.